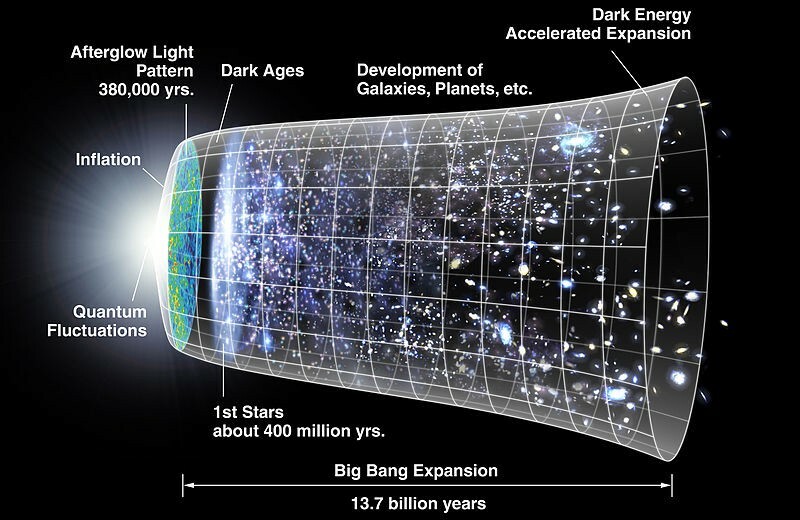 One of the great theories of modern cosmology is that the universe began in a Big Bang. This is not just an idea but a scientific theory backed up by numerous lines of evidence. For a start, there is the cosmic microwave background, which is a kind of echo of the big bang; then there is the ongoing expansion of the cosmos, which when imagined backwards, hints at a Big Bang-type origin; and the abundance of the primordial elements, such as helium-4, helium-3, deuterium and so on, can all be calculated using the theory. But that still leaves a huge puzzle. What caused the Big Bang itself? For many years, cosmologists have relied on the idea that the universe formed spontaneously, that the Big Bang was the result of quantum fluctuations in which the Universe came into existence from nothing. That’s plausible, given what we know about quantum mechanics. But physicists really need more — a mathematical proof to give the idea flesh. Today they get their wish thanks to the work of Dongshan He and buddies at the Wuhan Institute of Physics and Mathematics in China. These guys have come up with the first rigorous proof that the Big Bang could indeed have occurred spontaneously because of quantum fluctuations. The new proof is based on a special set of solutions to a mathematical entity known as the Wheeler-DeWitt equation. In the first half of the 20th century, cosmologists struggled to combine the two pillars of modern physics— quantum mechanics and general relativity—in a way that reasonably described the universe. As far as they could tell, these theories were entirely at odds with each other. The breakthrough came in the 1960s when the physicists John Wheeler and Bryce DeWitt combined these previously incompatible ideas in a mathematical framework now known as the Wheeler-DeWitt equation. The new work of Dongshan and co explores some new solutions to this equation. At the heart of their thinking is Heisenberg’s uncertainty principle. This allows a small empty space to come into existence probabilistically due to fluctuations in what physicists call the metastable false vacuum. When this happens, there are two possibilities. If this bubble of space does not expand rapidly, it disappears again almost instantly. But if the bubble can expand to a large enough size, then a universe is created in a way that is irreversible. The question is: does the Wheeler-DeWitt equation allow this? “We prove that once a small true vacuum bubble is created, it has the chance to expand exponentially,” say Dongshan and co.
Their approach is to consider a spherical bubble that is entirely described by its radius. They then derive the equation that describes the rate at which this radius can expand. They then consider three scenarios for the geometry of the bubble — whether closed, open or flat. In each of these cases, they find a solution in which the bubble can expand exponentially and thereby reach a size in which a universe can form—a Big Bang. That’s a result that cosmologists should be able to build on. It also has an interesting corollary. One important factor in today’s models of the universe is called the cosmological constant. This is a term that describes the energy density of the vacuum of space. It was originally introduced by Einstein in his 1917 general theory of relativity and later abandoned by him after Hubble’s discovery that the universe was expanding. Until the 1990s, most cosmologists assumed that the cosmological constant was zero. But more recently, cosmologists have found evidence that something is causing the expansion of the universe to accelerate, implying that the cosmological constant cannot be zero. So any new theory of the universe must allow for a non-zero value of the cosmological constant. What plays the role of the cosmological constant in Dongshan and co’s new theory? Interestingly, these guys say a quantity known as the quantum potential plays the role of cosmological constant in the new solutions. This potential comes from an idea called pilot-wave theory developed in the mid-20th century by the physicist David Bohm. This theory reproduces all of the conventional predictions of quantum mechanics but at the price of accepting an additional term known as the quantum potential. The theory has the effect of making quantum mechanics entirely deterministic since the quantum potential can be used to work out things like the actual position of the particle. However, mainstream physicists have never taken to Bohm’s idea because its predictions are identical to the conventional version of the theory so there is no experimental way of telling them apart. However, it forces physicists to accept a probabilistic explanation for the nature of reality, something they are generally happy to accept. The fact that the quantum potential is a necessary part of this new mathematical derivation of the origin of the universe is fascinating. Perhaps it’s time to give Bohm’s ideas another spin round the block. Follow the Physics arXiv Blog on Twitter at @arxivblog, on Facebook and by hitting the Follow button below.